August 4, 2010 by D.T. SUV practicality without fuel consumption worries. With the fuel efficiency gains of gas electric hybrid power, it wasn’t long before SUVs started adopting this green technology. 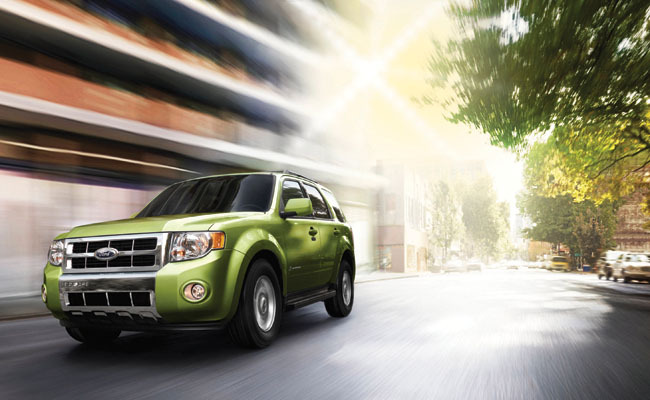 Ford was one of the early adopters, after Toyota, to equip its popular Escape compact SUV with a hybrid system. Ford launched the Escape Hybrid early in the decade and since then the model has been updated and modernized to its current form. Having driven the Escape on an extended trip, the 177-combined horsepower of the 2.5-litre four-cylinder gas and electric hybrid motor feels energetic and gives surprising acceleration. At one point, with no highway traffic and the gas pedal floored, the Escape impressed by reaching “hello, officer!” speeds effortlessly. The only downside was the aural whine of the engine as the continuously variable transmission kept the engine spinning at maximum revs. Driven in a more sedate manner, the Escape Hybrid’s gas engine combined with electric motors impresses with little fuel usage especially in stop-and-go traffic where fuel gains are maximized. At low speeds, the Hybrid system allows the Escape to run solely on electric power with no fuel use and zero tailpipe emissions. As for the rest of the package, the Escape Hybrid shares styling and interior amenities with the conventional gas versions of the Escape family. With the familiarity of the Ford Escape, the styling looks dated but still appealing enough not to offend. Its boxy styling with generous side windows gives excellent outward visibility and maximizes rear cargo carrying. Inside, the boxy exterior theme carries over. Hard plastics for the dash and door panels dominate the cabin. 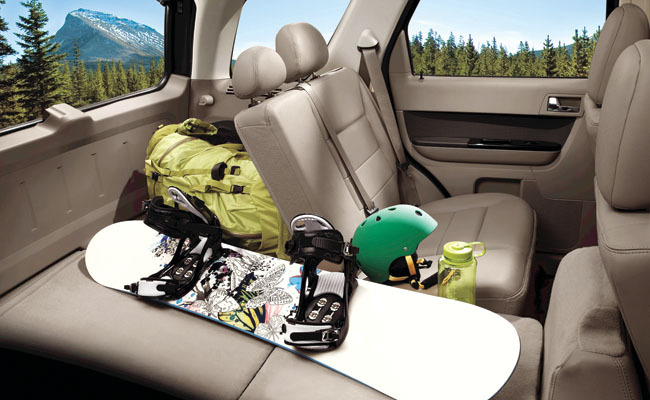 Where the Escape shines is in the availability of amenities that include leather seating, SYNC entertainment, Bluetooth communication system and navigation system. The system allows DVD movie viewing but only when parked, which is a great feature when waiting for the kids. A cool feature usually found in high-end cars like Lexus and Lincoln is the Active Park Assist system. For parallel-parking-challenged folks, this computer-aided parking system ensures text-book-perfect parallel parking each time. Enjoying the Escape Hybrid out in the wilderness makes sense as it threads lightly with little pollution to spoil the outdoors. Wrangler offers cool rugged looks and extreme off-road capability. On the other side of the scale is the iconic Jeep Wrangler. 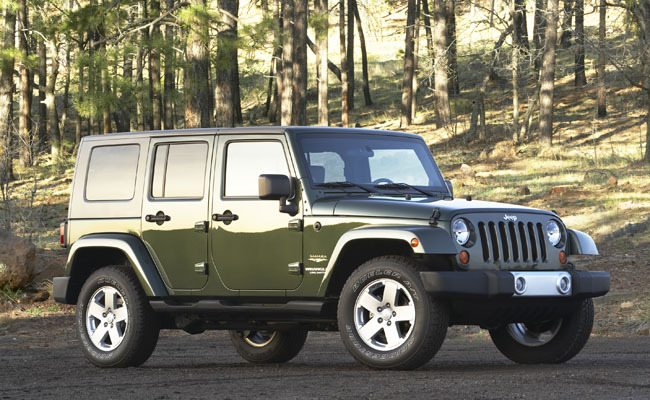 Easily recognized, Jeep’s Wrangler looks at home in any outdoor setting. 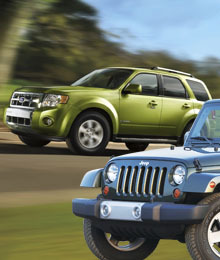 Its rugged yet simple looks have stood the test of time when compared to more contemporary looking off-road vehicles. Styling details that go against trend-setting aerodynamics include an upright foldable windshield, squared-off front fenders, protruding bumpers and blocky outside mirrors. But when seen in person, the Jeep Wrangler is at once appealing and sporty looking, especially in the two-door body style. 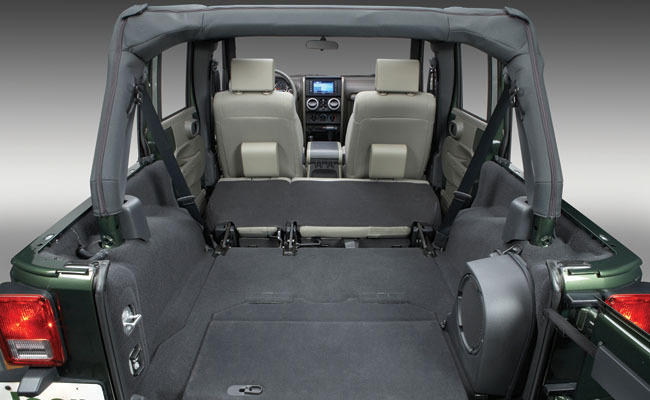 Also available as a four-door Unlimited, the Wrangler can accommodate rear passengers in relative comfort. My choice is the sporty two-door as its proportions look just right. The Wrangler really comes into its own cool style when it transforms into a naked convertible. This requires folding the windshield assembly forward, removing the roof and doors for a totally different look. Removing the doors helps with off-road visibility, especially when trekking on tough challenging trails where the part-time four-wheel-drive system and rugged suspension design showcases its extreme capability. Having driven the Wrangler on some tough sections of unpaved trails, the off-road capability is outstanding, especially when using low-range four-wheel-drive and crawling over intimidating terrain that looks almost impossible to drive on. The 202-horsepower 3.8-litre V-6 engine provides lots of low-end power, ideal for its mission in the outdoors. When driven on highways and civilized city streets, the Wrangler becomes loud and provides a bumpy ride compared to city slicker SUVs. It’s still fun as the Wrangler does not pretend to be anything else than a rugged go-anywhere off-road machine. Its interior design also reflects the simplicity of the exterior with durable materials and plenty of grab handles. Contemporary features include available navigation system, 368-watt Infinity premium sound system with Satellite Radio, Uconnect Bluetooth voice command system, leather seats and more. With a base price of under $20,000, the Wrangler is a way cool alternative to the boring compact sedans in the same price range.